This past week has been very stormy with cold, fog, wind and rain but our new oil stove is working beautifully and has changed our lives during that kind of weather. Its very nice not to be worrying about having to fly and get wood at the coast with all the wind this year. Even on the hot sunny days, the wind will suddenly come up. Twice I have been caught at the salmon research station, having to wait many hours until it goes down enough to allow me to fly home. The manager of the station, Alexi Maslov, has not seen such a windy year since 1982. Alexi and his wife Katja are wonderful and interesting people, both scientists in the old style, pure Russian, way, so the time is well spent (they speak pretty good English). Maureen and I have extended our study to the research station as well. 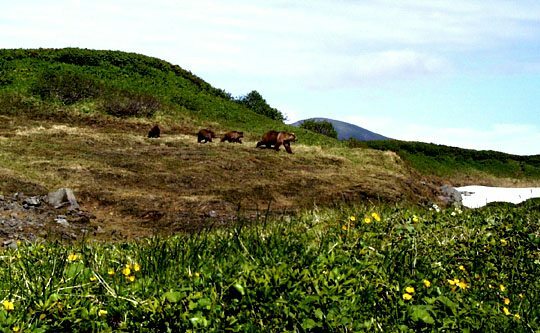 In the spring of last year we built a electric fence around their village which is home to 20 to 30 people including children, to see if the conflict they experience with bears could be reduced. 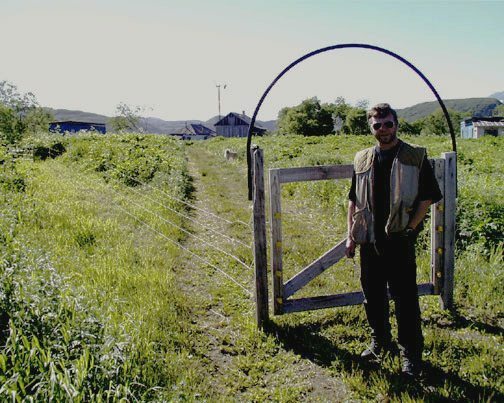 Because it is situated where the river flows out of the lake, which is a cross road of bear activity, there has always been difficulty with bears getting into their gardens, garbage and smashing the fish weir, which is a fence across the river with gates that allow the salmon that come into Kurilskoye lake each year to be counted (usually around 2 million). Also, there was the constant worry that goes with children playing while the many bears also used the people trails between the buildings. Alexi and Katja tell me, and I can see, that all this has changed with the fence in place. 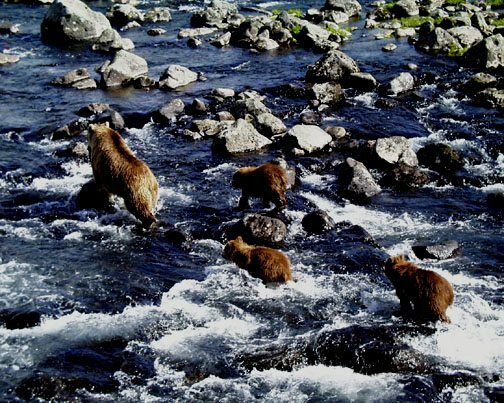 Because the fence only encircles the encampment but leaves room for the bears to still wander along the river bank on their traditional trails, there is no real disruption to the 70 or more bears who use the area and also have important lives to live. Alexi told me that early this spring, while there was still snow on the ground, he saw where the tracks of a bear approached to with in ten feet of where the fence had been but had yet to be erected this spring, then turned and continued half way around the perimeter of the fence but staying on the outside. This was a bear that had been there the previous season and still respected the fence, even though it did not exist. It was the first spring, in the 17 years he had been at the station, that he never saw bears around the buildings, even though there were the usual number around. This is probably the best example in the world of people living with bears with the least amount of conflict. It is fitting that Kurilskoye lake should perhaps once again have this distinction. Three hundred years ago there were 13 villages around that lake, of Ittlemen who were pastoral tribes of fishermen taking advantage of all the salmon there. Of course they were not the only ones thriving because of the abundance of fish in the area. Without guns they were somewhat obligated to get along with what must have been very dense population of bears. It was share or go live someplace else. I scoured the Science Library in Petropavlovsk looking for references that would describe how those people might have lived with so many grizzlies in those days. Surprising to me, there were few references but one scientist - explorer around 1735 who's name was Kreshinikov , devoted one page of a very large book about Kamchatka to this topic. He describes a peaceful a scene of women and children in the tundra, berry picking along with "herds of bear" and the biggest conflict that he observed was that once in a while a bear would take a basket away from someone and eat the berries. Of course this is a topic that fascinates me and it frustrates me that I can find so little written about it from those days. But if you think about it, back then, to get to Kamchatka from western Russia you would have had to have crossed about 7000 miles, by horse or by foot, all of it wonderful bear country. By the time you got here, they were probably so much a part of your life as to be hardly worth mentioning. Yesterday was the first flyable day for a while so I took a run down the river to see if there were bears catching salmon. There were many, so I came back and Maureen and I walked down to see if we could get some pictures as the sun was bright and the air so very clean. The only problem was that the wind was blowing down stream. So we made a big loop away from the river, coming back to it beyond where I had seen most of the bears from the air, then worked up wind, up stream. We had a wonderful time, especially with a female with three yearling cubs.